Event #9 of the 2013 World Series of Poker, the $3,000 No-Limit Hold’em Shootout, saw 477 players hit the felt on Monday for the first round of action. For those unfamiliar with a shootout tournament format, a player must win all of the chips at their table in order to move onto the next round. Essentially, it is a single-table tournament. The final player of each table with then compete in the next round until it reaches the final table. Then, each player will start with an equal amount of chips. Many top players, including Daniel Negreanu, believe that shootouts required more skill than traditional tournaments because they encompass many poker skills throughout the event, which typically are only applied at the final table of a regular tournament. In between breaks of the first round on Monday, we had the chance to speak with a couple of pros and get their opinion of a general strategy for a shootout, and discuss other issues like heads-up play and any advantage that online players may have. 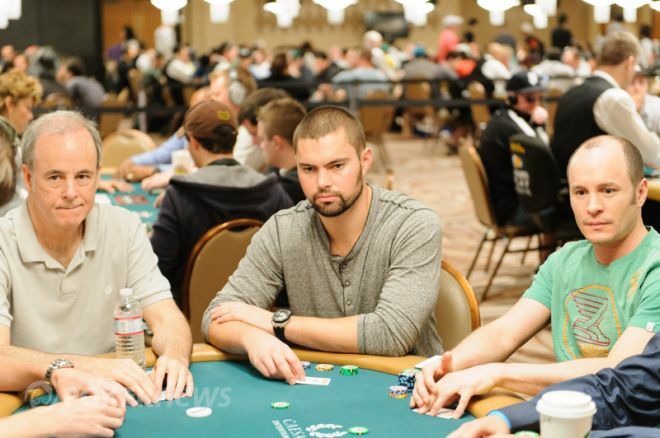 PokerNews: You seem to be crushing your first table with a sizable chip lead. Is there a strategy you have in place to do well in this event? Minieri: “I don’t think I’m really crushing but I am doing very well. For an event like this, it’s not really about strategy but about representing yourself on the table and a little bit of luck is nice. Today I think I am playing good poker and I hope to keep doing well. Do you play differently on your first table than if you advance to the later levels? "I always try to adapt myself to my opponents. This table I played one way and the next table I may have to change depending who I am playing against." PokerNews: Is there a general strategy for a shootout event compared to a regular no-limit freezout? O'Dwyer: "Because it’s a winner-take-all structure you just have to play crazy aggressive. Sitting back and waiting for hands is not a good strategy to have because you’ll just pass on many spots to potentially chip up. You have to go hard at every pot that you’re in and do your best to take it down." You were playing Matt Salsberg heads-up. Can you describe what that was like? "He’s definitely a very good player but I’m confident that I can do well. My heads-up game is a little bit rusty but I used to play heads-up a few years ago so I’m still pretty comfortable with my skill level. I haven’t played as much as I did in 2007 and 2008 but I’m still happy with my heads-up game." You say aggression is huge in a shootout structure. Do you become even more loose-aggressive as you advance? "Most definitely I do. Especially as you get more short-handed you have to open your range hugely. With the structure as a winner-take-all event you have to vamp it up even more. This is just a tougher field for amateur players because they’re just not as comfortable playing this type of format. Playing tight-solid just doesn’t work in this structure. It’s definitely more cut-throat." PokerNews: Do you think online players have an advantage at a shootout event? Sands: "Yes, you can definitely say that online players have an advantage in a shootout tournament. 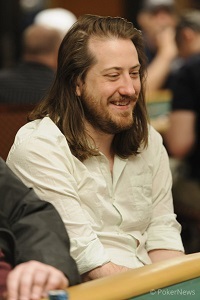 Compared to other WSOP events, online players definitely have an advantage in this event. They are so much more used to playing short-handed and making it to the end of tournaments because they’ve played so much more. "Typically, players who play mostly live tournaments don’t play five- or six-handed or in independent chip model (ICM) spots very often — or three-handed or heads-up for that matter. Other events online players have an advantage on are six-handed or four-handed tournaments."